The vangas display a remarkable variety of body formats over a relatively small size range. They start with the small vireo-like Calicalicus species, which glean small insects from foliage, through the nuthatch-like Hypositta, via the wood-swallow-like Chabert's vanga (Leptopterus chabert), and the electrified blue vanga (Cyanolanius madagascarinus), the thick, powerful-billed hook-billed vanga (Vanga curvirostris), Xenopirostris, and white-headed Leptopterus viridis vangas, to the larger and more extravagantly adorned sicklebilled vanga (Falculea palliata) and helmet vanga (Euryceros prevostii). The sicklebilled vanga is a large vigorous bird with a bill that is evidently suited to winkling invertebrates from their hiding places. The helmet vanga sports a huge flattened pale-blue instrument that has no apparent foraging advantage, given that the species prefers small insects to opening coconuts. In general, apart from their bills, vangas are similar in form in that they have rather stocky solid bodies, short wings, medium-length tails, short and rather strong legs, and large eyes. About the only exception to this is the Chabert's vanga, which has rather long wings suited to its largely aerial life. It is in the bill and head structure that the vangas really distinguish themselves. The 16 species of vanga can be divided up into three main groups—relatively slender, narrow bills for gleaning and general insectivory (red-tailed [Calicalicus mada-gascariensis], red-shouldered [C. rufocarpalis], nuthatch [Hy-positta corallirostris], Tylas [Tylas eduardi], Chabert's, and blue vangas), laterally flattened bills for breaking open insect refuges or killing large invertebrates or small vertebrates (white, Pollen's [Xenopirostris polleni], Van Dam's [X. damii], Lafresnaye's [X. xenopirostris], and hook-billed), and the oddities, sicklebilled and helmet vangas. latter form has been seen so few times the question is not yet resolved. 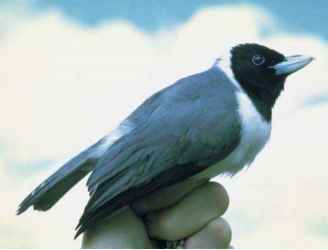 Most species are some combination of black and white, with some showing larger areas of red. The smaller vangas are brightly colored, the red-shouldered and red-tailed with black bibs, gray caps, and reddish wingpatches, the blue vanga with an ultramarine back and bill base. Chabert's vanga is unique in the family in having brightly colored blue skin around the eye. 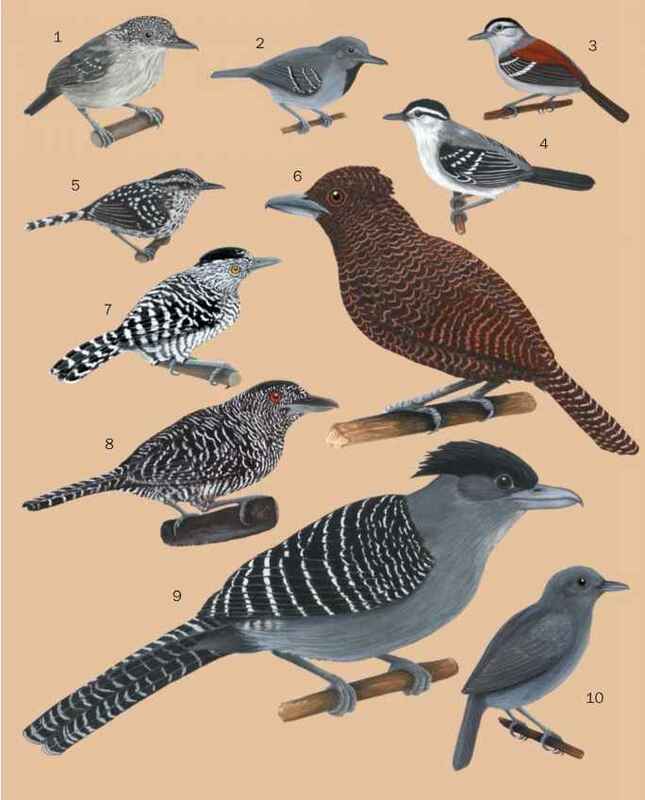 Rufous and helmet vangas are black, red, and white with pale blue bills (though of dramatically different form), while the other species are essentially gray, black, and white. Juveniles of many species and females of some (Pollen's, Van Dam's) show variable amounts of orange underneath, while in the Tylas vanga both sexes are orangebellied. The nuthatch vanga is the only species with an orange as opposed to grey, blue, or black bill.